What happens to a young adventurer when he does not believe in the mystical powers that aid him? 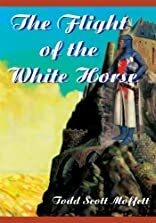 Prince Tomlin, the hero of The Flight of the White Horse, makes the painful decision to run away from his father, King Terel, when he learns that his true love, the Lady Vera, has been entrapped in a magical necklace by the villainous Lord Harra. During his quest to rescue Vera, Tomlin resists the sorcerous wiles of the Lady Sharamar and battles storms, thieves, madness, and magic before his final confrontation with Harra. If he hopes to resist Harra�s magic and rescue Vera, he must fulfill the prophecies of his country�s mythological hero, the White Prince. But as long as Tomlin refuses to believe, the White Prince will not endow him with the centuries-old powers he needs. About Todd Moffett (Author) : Todd Moffett is a published author. Published credits of Todd Moffett include The Flight of the White Horse.